So I've always wanted to make a birdhouse or a bird feeder and now that I've finished the landscaping in the newly found backyard patio, what a better time. I looked for "thin" wood like what I've seen the pre-made birdhouses made of, but couldn't find it at a reasonable price. So I decided to use a couple of my 40% off coupons and just buy the pre-made ones. They are awfully cute after all. I dug up some really old acrylic paint and some newer acrylic paint and went to work mixing some to get different colors. 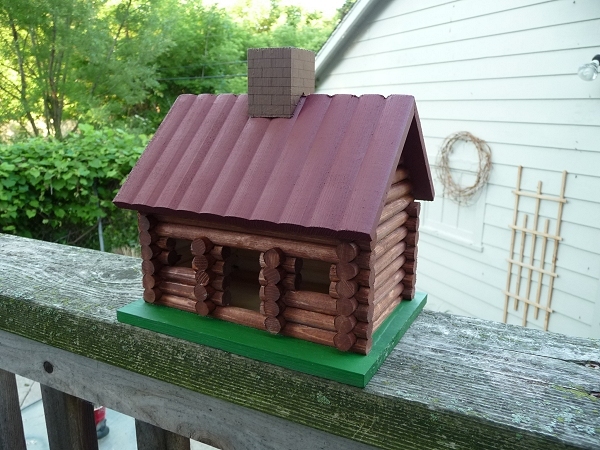 For the log cabin, I stained the log and the chimney is drawn on with a Sharpie. For the feeder, I made 6 inserts to cover the window before painting so I didn't have to be too careful with all that trim then painted them. Lastly I sprayed both with an matte acrylic sealer. The birdhouse looks a bit funny on its big pole. 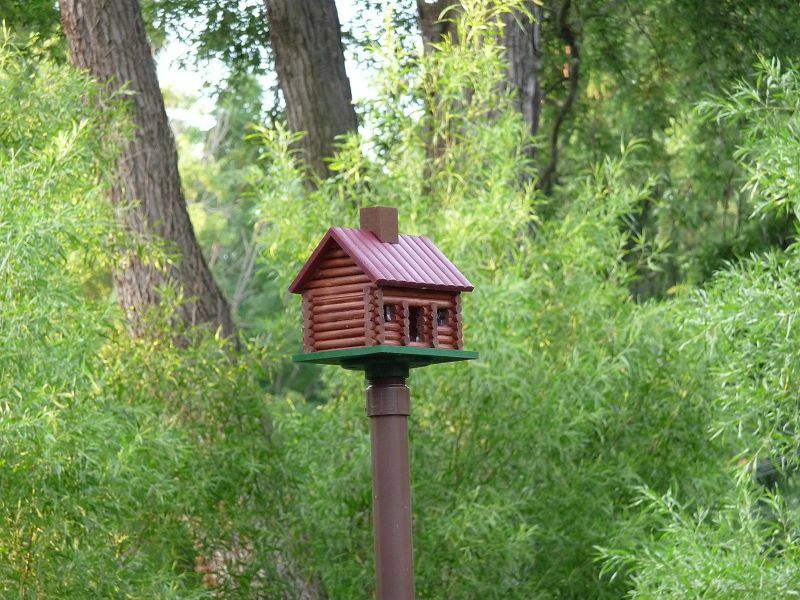 The pole is a PVC pipe that I painted with a floor pole plate thing attached to the bottom of the birdhouse then the connector piece on top of the pole fits into the floor thingy. I secured the pole in the ground by cementing a slightly larger piece of PVC inside of a 4x4 cement block. When dry, I fit the tall pole inside the mounting pole and inserted two bolts through predrilled holes. It seems to be working fine and it's not too wobbly in the wind. 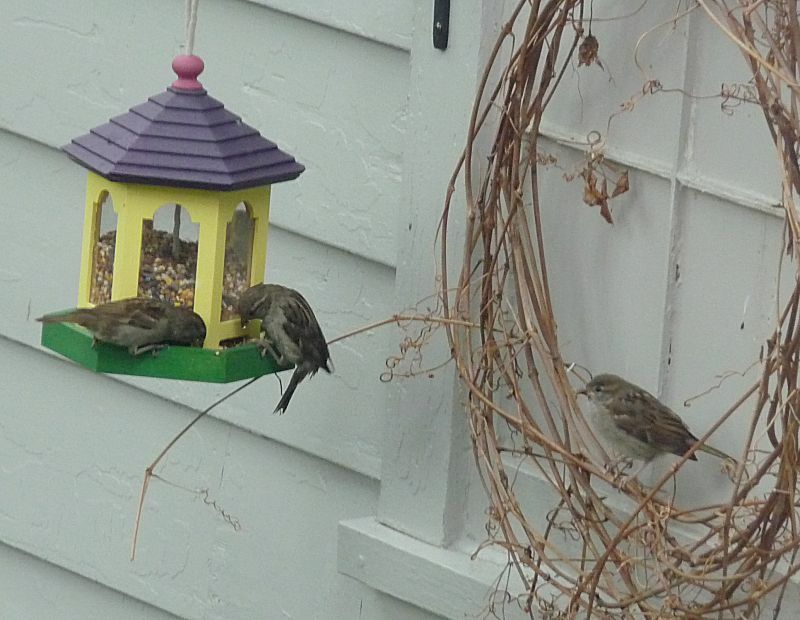 The ivy wreath is in a perfect spot for birds waiting to get onto the feeder; yes, it's that busy some days. I've only seen a male and female Cardinal, Sparrows, and Wrens so far. 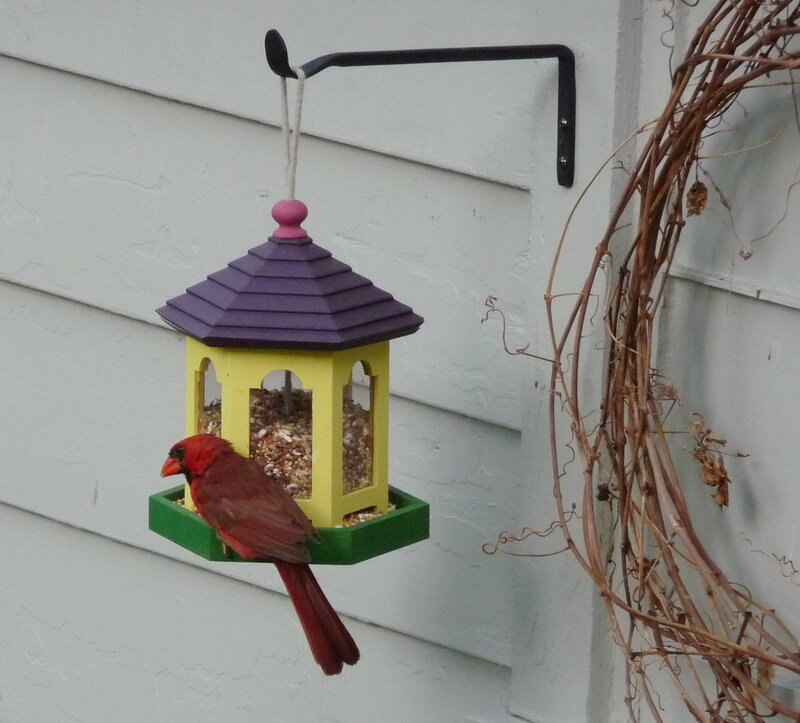 The feed is the cheapest "morning song bird" mix from Walmart at about $5 for a 10 pound bag, which is a good thing too because they can easily eat an entire feeder full in a day! I was disappointed when I discovered that the wood of the bird feeder had split from the weather. I took it inside and pretty much disassembled the entire top and the tray and re-glued them with Gorilla Glue for wood. They probably used some cheap glue or not enough and the slightest bit of moisture spread the wood apart. Yeah, I sealed it, but not super well, I figured a few light coats would due. I'm now re-thinking that thinking. I haven't taken the log cabin back down for inspection, but I'll bet it's splitting too. About a year later, I came to the conclusion that the bird feeder was put together with white glue which dissolves when wet. Read more about it on this post. At any rate, I'm enjoying watching the birds from time to time and I wonder if anyone will move into the birdhouse.